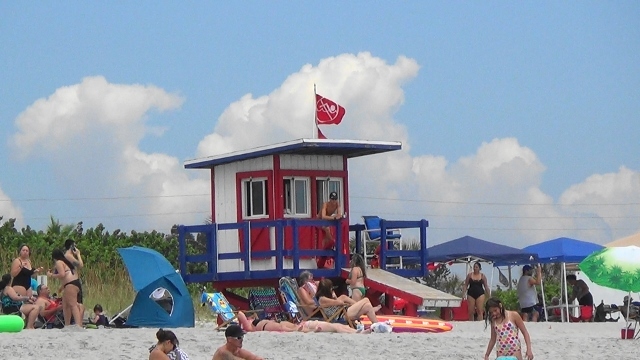 Double red flags flew over a lifeguard tower at Shepard Park after sharks were spotted on July 31, 2016. COCOA BEACH, Florida - Brevard County Ocean Rescue lifeguards temporarily ordered swimmers out of the water along a stretch of beach in Cocoa Beach, Florida after sharks were sighted swimming in nearby. On Sunday, July 31, 2016, sharks were spotted in the Atlantic Ocean chasing a school of bait fish off of Shepard Park located and the end of State Road 520 (Cocoa Beach Causeway). Swimmers were ordered out of the water from approximately 11 a.m. to 11:30 a.m.
Tiger, Bull, and Blacktip sharks around 2-6 feet long have either been spotted or caught near-shore off of Florida's Space Coast in July. A record number of sharks were found during NOAA's coastal shark research survey along the U.S. East Coast in 2015. More than 2,800 sharks were captured and tagged - the most in the survey’s 29-year history. How to spot sharks in the water: In addition to spotting the telltale shark dorsal fins, fish jumping out of water or sea birds hovering at the surface of the water as shown in the video could indicate the presence of feeding sharks. Swim near a lifeguard area (their elevated position on a lifeguard tower is better for shark spotting) and pay attention to warning flags.